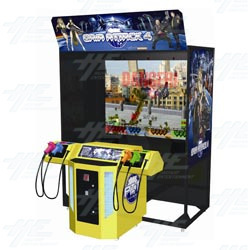 Gaia Attack 4 is a 4 player light gun shooter from Taito. Users play as 'Ghostbusters' whose goal is to kill as many ghosts and aliens as possible. The game features video footage of real world environments, overlaid with cartoon computer images of aliens, creatures and more. Gaia Attack 4 is part of Taito's 'No Kou' ('No Thought') series of casual arcade titles. It features streamlimed gameplay, making it appeal to a broader audience. Gaia Attack 4 is a 4 player light gun shooter from Taito. Users play as 'Ghostbusters' whose goal is to kill as many ghosts and aliens as possible. The game features video footage of real world environments, overlaid with cartoon computer images of aliens, creatures and more. Gaia Attack 4 is part of Taito's 'No Kou' ('No Thought') series of casual arcade titles. It features streamlimed gameplay, making it appeal to a broader audience.